Available on Amazon, Barnes & Noble and Christian Book today. Have a fridge full of staples, a family of finicky mouths to feed, and only a few minutes to get something on the table? If this sounds all too familiar, chances are you’ll find dinner and more in this can-do approach to mealtime. 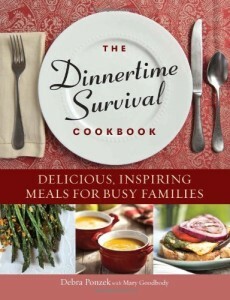 The Busy Family’s Survival Cookbook is designed with the modern-day family in mind—too busy, with not nearly enough time to eat together—and makes delicious meals come together in a snap. With a focus on accessible recipes with only a few simple ingredients, this guide takes the humble pantry staple and transforms it in minutes into delicious restaurant-quality dishes.